Really, when I sat down at the sewing machine to make these I didn’t even know where I was going with them. I just sort of started putting pieces together and seeing what looked good until I had these two guys created. The idea here is that you can do anything YOU want for yours. I have shown you some options: 1 big eye or two googly eyes, 1 horn or 2, add hair, add a bow, a whole row of sharp teeth, a few crooked and crazy, a nose or not. It’s all up to you. I’m going to show you how I did various parts, but then you can create whatever you want from there. Oh and 1 thing to mention. I have too many hooded towels in my house so I am selling these guys. $25 a piece plus $5 shipping for each. Email me if you want them. First come, first serve. Amberaprice at gmail dot com. 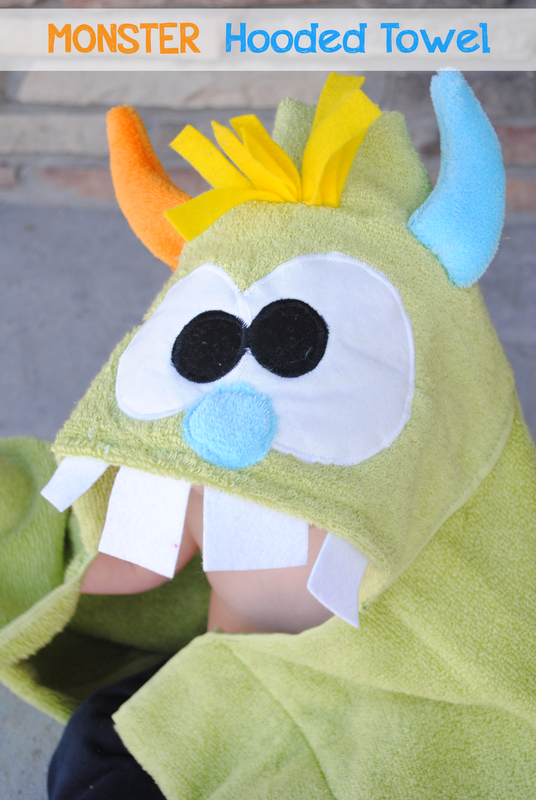 Optional accessories: other colors of fabric, towels, felt, fur, ribbon, whatever you want to use for your monster. 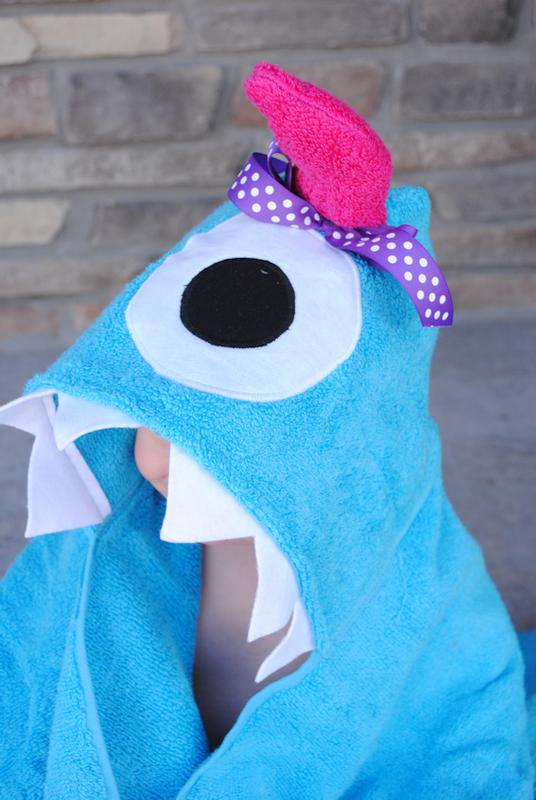 I have a full tutorial on how to make a hooded towel here so I am not going to break down all the steps of making the actual towel part, I will just show you the monster things here. 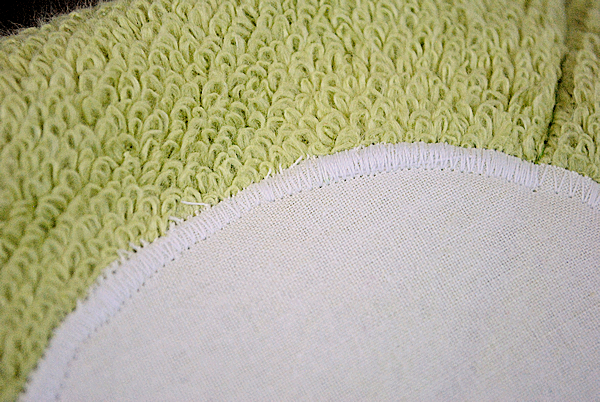 Go to that tutorial for the towel making details. Now, to add my horns here is what I did. Cut out your fabric in the shape of a horn (any shape you want is fine). Cut 2 matching pieces per horn. (I used fuzzy fabric because I have a lot on hand.) Then you will sew your two pieces together leaving the bottom open so that you can turn them right side out. Turn it right side out (and stuff it with stuffing or something if you want). 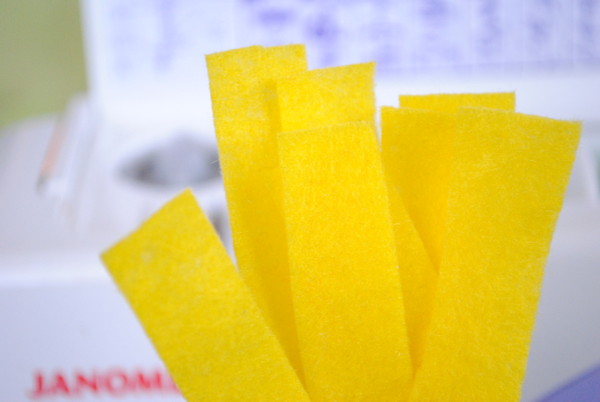 To do the teeth I just cut out my shapes from felt. For the sharp ones I did a long string of them, for the rectangle ones I cut them separate. Either way works. 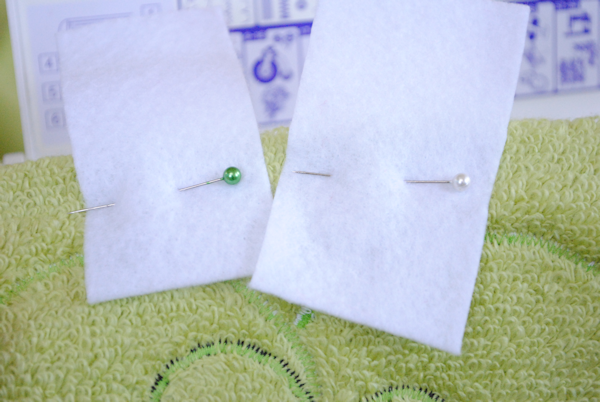 Then pin them in place and sew a line across them to hold them in place. To add the bow you can either hand stitch it in place or use your machine. 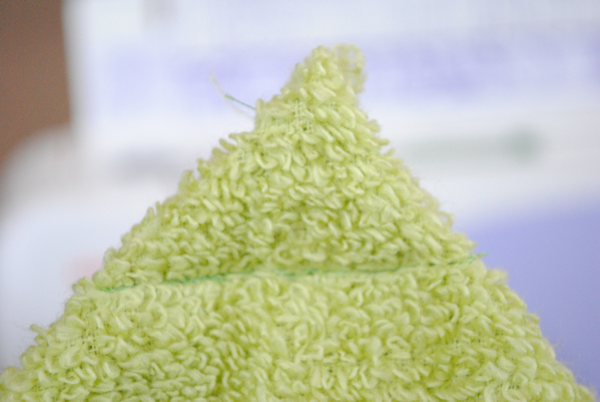 To attach your hood to your towel go to the hooded towel tutorial here. And you’ve got something pretty great! Happy sewing! And be sure to check out all of the hooded towels and stick around for a new one each month. totally adorable. 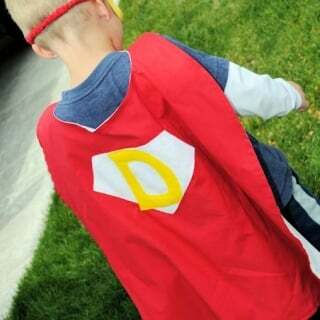 have to sew this for my triplets boy this summer thank’s such a great tutorial. These just keep getting cuter and cuter ~ or is this one scarier? lol Great job. I need to ask for help because it’s been requested of me to make a new hooded towel for my Granddaughter. You towels, and any others I can find online look like they would be just huge on her as she’s only 1 yr old. Is there any chance you have any ideas for measurments to make these slightly smaller for the younger children? I am sure given the size these appear to be that she would swim in one of these using a bath towel because she’s still so tiny. I personally really like the bigness of them even with babies. I use them with all of my babies and it wraps them up so nice and warm when they are little. Hi Amber. Thanks for your learn to sew series, I’ve been coming along and I sure do appreciate your hints. I have a question on the frog hooded towel. I am really struggling with getting the nose applied to the main part of the towel. I used the same towel that you did, from Target, but I have broken two needles trying to get through all the thicknesses. You told me about the lever to lift the needle higher, but even with that, I have to stuff the thicknesses through and then the machine just won’t go through so bulk. It keeps stopping and won’t feed the fabric through. Can you help me? Grandbaby is coming for a visit this weekend and I’d love to have it finished! I actually pull my fabric pretty hard in those spots. Don’t let the machine do all the work, give it some pulling of your own. And you can use a heavy duty needle if needed. How Cute!!!!! My girls would love these!!!!! Thanks for the great tutorials! 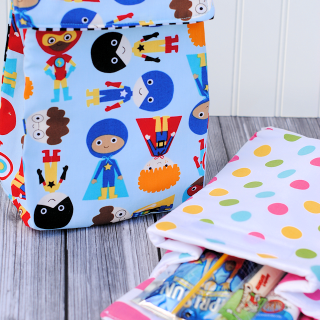 I can’t wait to make some of these for your boys with my new skills from your Learn to Sew series! LOVE LOVE LOVE! Found you over at Tip Junkie! I’d love for you to come link this up at my Tuesday Time Out! These are too cute! I have no idea how to sew (it’s on my “learn one day soon” list), and this makes me wish I did. Adorable! Thanks for sharing. 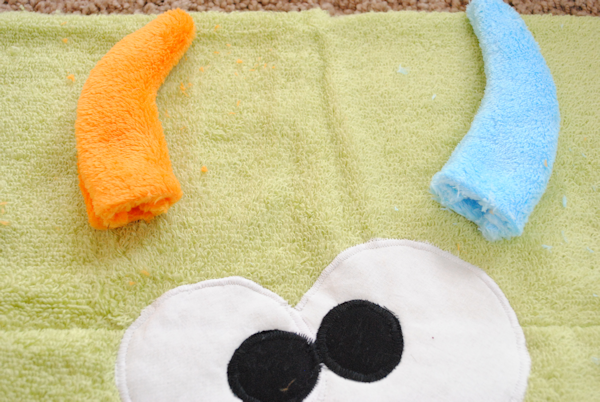 I have made hooded towels before, but these are so fun & creative! I am pinning & I’d LOVE to try this some time. Thanks for the inspiration. Oh my goodness! That towel is so cute! I am definitely making one for my son. These are friggin adorable!! Must make ASAP. I’m a newbie sewer so we’ll see how they turn out. 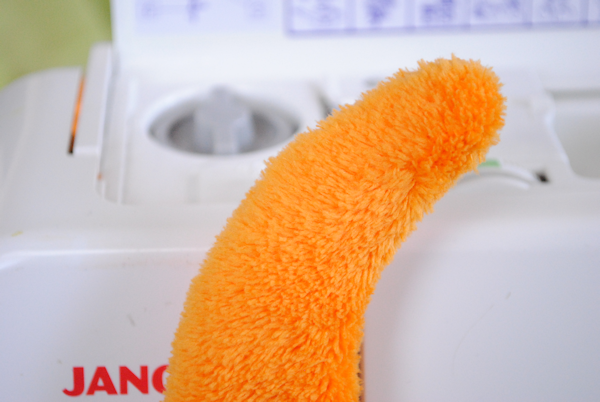 One question though…how well does the felt hold up when washing this towel? Thanks and awesome blog!!! Not great. Use cotton or fleece maybe? 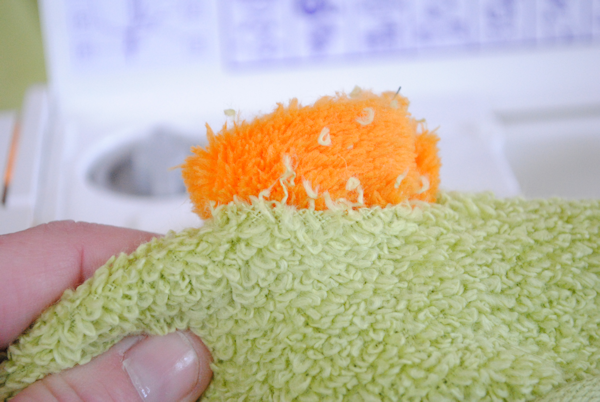 Or use scraps of all the left over towel pieces. 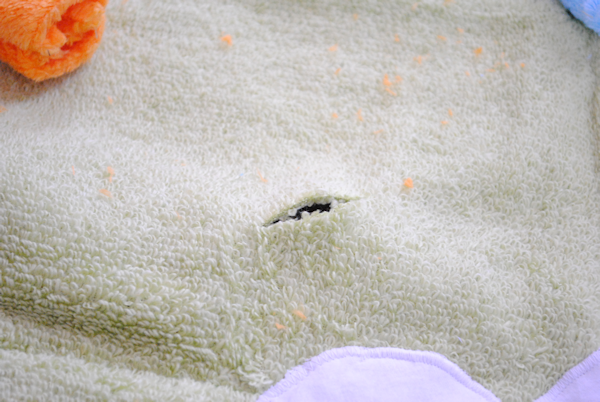 I made hooded towels when my kids were little and lost the pattern. Was thrilled to find your instructions. Makes awesome baby gifts. Thank you so much for your towel tutorials! 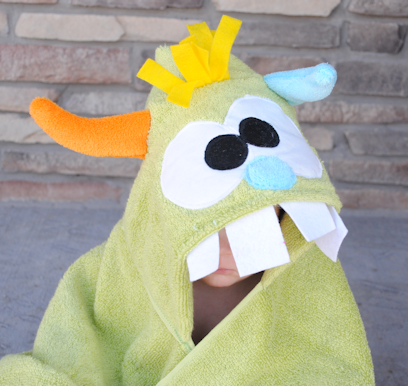 I did this monster towel in my sewing class and everybody was absolutely crazy about it- you’ve got a bunch of new fans!! The hood turned out huge (I used a towel piece approx. 20 x 20 inches) even for us adults and let alone for my 9-month-old girl, though, so I’ve just made another, smaller hood from that 2nd half of the hand towel, using a piece of approx. 16 by 16 inches. Maybe this helps those people who find the hood a bit too large. Again, thank you so much for sharing these cute, CUTE ideas so generously and even telling us beginners how to make them! Yes, but it doesn’t hold up very well. Use cotton if you want or fleece. 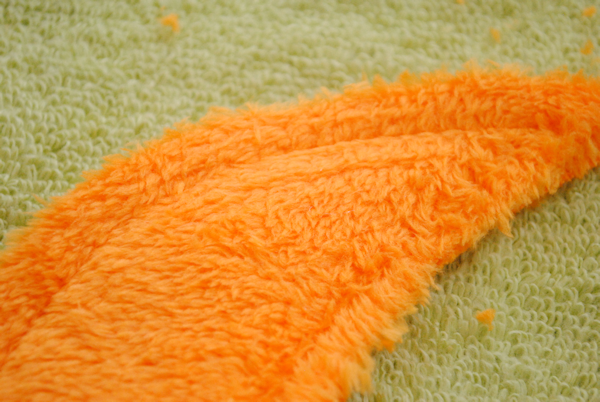 Fleece isn’t the greatest, but probably better than felt. 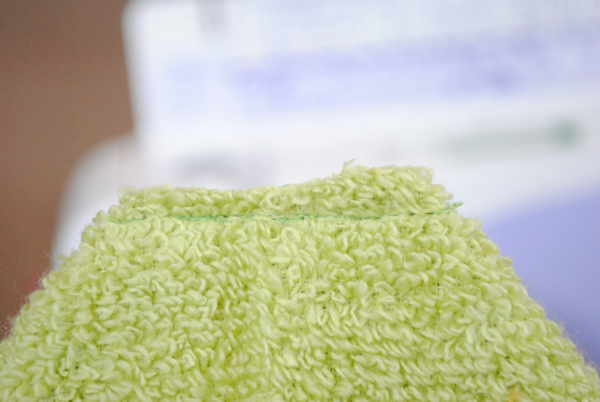 I should measure my hand towels and put the measurements on the blog. I’ll do that. I cut them all exactly the same. I am thinking I need to put the measurements for how big my hand towels end up being. I think this , the green one, is your best so far, but I feel that way each time a new one is posted. I love the colors and I have 11 great grandbabies who will love these also. Thank you for your time and talent. Im from Mexico and I have a question … what is Heat ‘n’ Bond?? It’s a type of fabric?? Im sorry about this, but maybe in spanish has another name but I dont understand exactly what it is … :) thanks a lot !!! Oh sorry! I need to call it by it’s true name…which I can’t think of! It’s iron on transfer so that you can iron one piece of fabric to another. 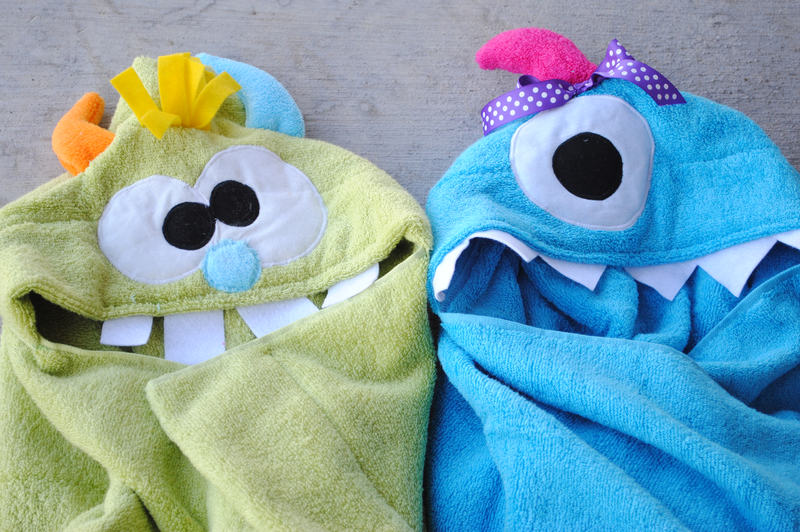 I love your idea of the monster towels. My daughter is expecting twin boys so I’d like to make something special for her. the problem is…..I am not a sewer!!! I think I could make these as you did, but wondered if anyone had other ideas for twin boys. Thanks!! Love these! Do you have the pattern pieces for the eyes and horns? I didn’t do pattern pieces on this one since it’s supposed to be a little crazy but you can find the eye pattern on any of the other hooded towels. 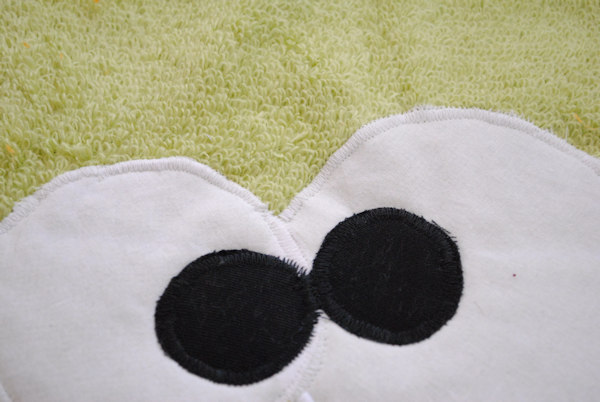 I love all your hooded towels and have made 3 of them already, Elmo, Angry Bird, the Red one and the bunny. My Grandchildren love them and my children are asking me to make more for there friends for gifts. Thanks so much for sharing, they are all really cute, and fun to make! These are absolutely adorable and I can’t wait to start making one! I just bought felt for the hair and teeth and was wondering how they hold up through the washing machine. Have you had any problems with the felt? Thanks! The felt will sort of get yucky over time. You can use fleece if you want and it will last a little longer.